The last time we wrote about Windows 8.1, we had lots to talk about, but very little to share in the way of hands-on impressions. You see, though Microsoft unveiled loads of new features, apps and UI tweaks, it only released a handful of screenshots -- and nobody outside the company was permitted to actually use the new software. Today, though, the OS update is available for anyone to download for free; in fact, because we're oh-so special, we've been playing around with it for about 15 hours already. So while that's not enough time to put together a comprehensive review, we feel qualified to offer a few early thoughts. If you're curious, you can meet us after the break for impressions on everything from the new panorama capture feature to Xbox Radio. And yes, we brought screenshots this time. Lots of 'em. First things first: a disclosure. Because we started testing Windows 8.1 before it was actually available in the Windows Store, we had to borrow a Surface Pro from Microsoft with the software installed, similar to the way we routinely call in loans on review units. By the time you're reading this, though, the preview will be live in the Windows Store; all you'll have to do is hit download and let your system take care of the rest. As it happens, we expect it will be very hard to miss the download prompt in the store: Microsoft intends to add a "Windows 8.1 Preview is here" note even on individual app download pages. So even if it's the Vevo app you're after, you might still see a prompt to update the OS. Oh, and this might be a good time to give you a heads-up about apps: not all of them will run properly on Windows 8.1, at least not in the beginning. Microsoft says that's simply a function of the operating system still being in its preview phase. Ultimately, company reps say, the goal is for every app to run properly on 8.1, no exceptions. Yes, as you may have heard, the Start button is back in Windows 8.1, insofar as there's now a Start icon fixed to the lower-left corner of the screen. (You can't disable it.) Click on it, though, and you'll still get the modern Start Screen, not the old-school fly-out menus. If you ask us, then, it's a little hyperbolic to call this a step backward, though it sure does make the OS feel a little more familiar. If you really want to relive the old days of Windows, though, you'll need to make a few additional settings tweaks yet. 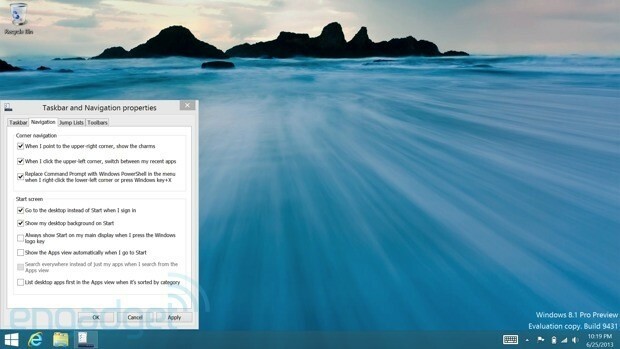 For starters, you'll want to enable boot-to-desktop, by right-clicking on the Taskbar, and then clicking "Properties." Stay in that same menu, and you can opt to have the same wallpaper for both the desktop and Start Screen. And really, you should try this out, not that it's our place to tell you what to do. 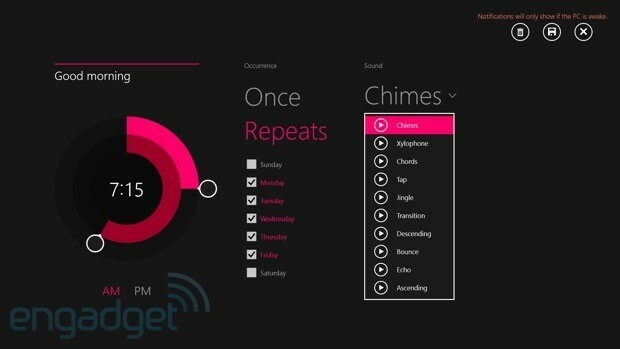 It's the sort of feature that should have been an option in Windows 8 to begin with. But as simple as it is, it's an important change too. Having a consistent wallpaper lends the OS a more cohesive feel, and makes the jump between the desktop and Start Screen feel much less disorienting. And that's a very good thing indeed. For those of you who've gotten used to the constant back-and-forth between desktop and Metro layouts, you now have a few additional options for personalizing the Start Screen. 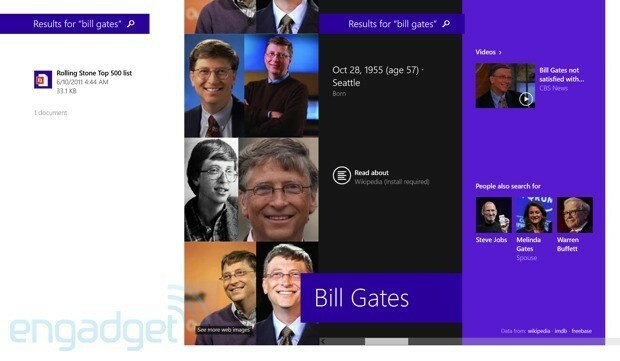 The big change is the addition of so-called Motion Accents -- live backgrounds that move as you scroll through tiles. Things like a dragon with a wagging tail, or a robot with spinning gears. As we said the first time we saw it, it's not unlike live wallpapers for Android, except the effect here is subtler. Additionally, you can now do more with the lock screen -- if you want to. 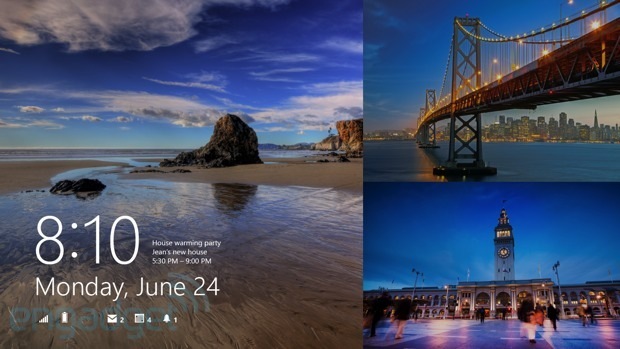 With Windows 8.1, you have the option of running a slideshow on your lock screen, with photos coming from various places, like your PC and SkyDrive. 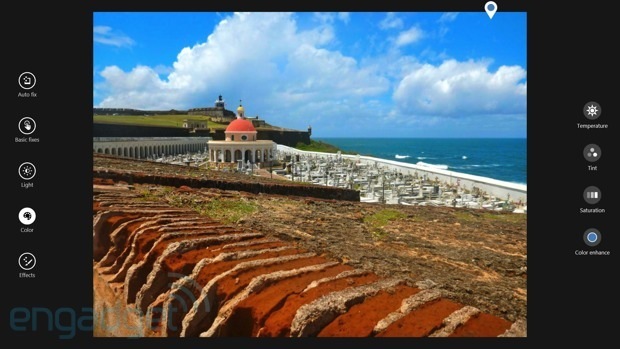 As Microsoft has done before, the photos are often seasonal, in that the PC will automatically select photos taken around the same time in previous years. The difference is there are no stock photos this time around; just the pics you've taken. In addition to letting Windows choose photos for you, you can also elect to enable the camera in lock-screen mode. Basically, when you allow for that, you can snap photos without entering a password, but you can't page through older photos or edit any of them. You can also accept Skype video and voice calls from the lock screen, similar to the way you can answer your phone without punching in a pin first. Anyhow, the keyword here is "optional." You can enable or disable most of these in the PC Settings menu, which, by the way, now offers the same set of features as the Control Panel on the desktop. With Windows 8.1, you get two additional tile sizes for the Start Screen: large (about the equivalent of two of our medium ones) and small (a quarter of a regular one). To resize a tile, just hold it down and select the "resize" option at the bottom of the screen. We played around with it a bit, mostly to see what sizes worked best for different apps. By default, the weather app in our build came in the largest-possible size, and we ultimately decided to keep it that way; shrink Weather down and all you get is a sun icon. But blow it up and you get two days of weather forecasts, complete with high and low temperatures and a brief summary of what to expect (e.g., "light showers"). Much more useful that way. As for the small icons, Microsoft says you might want to use that option to condense a large cluster of programs, like Adobe Creative Suite. That's a fair point; though we'd also add that it comes in handy for apps you just don't use that often. You only occasionally take photos with your tablet? Just shrink down the camera icon so that it doesn't take up precious Start Screen space. And as silly as it sounds, we also spent a good few minutes organizing and re-organizing our apps. It's hard to believe, but until now you could only view the master apps list in alphabetical order. Now you've got several other choices: category, most-used and date installed. To each his own, but we have a soft spot for the category option: how else are we going to zero in on "Bing Health & Fitness"? Another decision you'll have to make for yourself: whether or not to let apps automatically appear on the Start Screen after you install them. Maybe you think you'll need a shortcut for every app. As for us, we liked how little clutter there was on the Start Screen compared to the master apps list, but again, don't let us dissuade you from pinning things. Even if you are stuck with just two windows, though, you at least have more flexibility in how you actually arrange them. Whereas before you were forced into an 80 / 20 split, now you can do 50 / 50, 60 / 40 -- whatever floats your boat. Also, Windows 8.1 has multi-monitor support, so even if you can only manage two windows on your laptop screen, you can view a totally different set of apps on your secondary display. As you'd expect, resizing a window just means grabbing the windowpane with your mouse or finger, and then sliding it either right or left. Additionally, it's pretty clear when you've exhausted your window limit; your PC simply won't let you snap anything else into place. Specifically, if you've run out of open slots, you'll get a visual cue prompting you to replace one of the currently filled Snap windows. Makes sense to us. 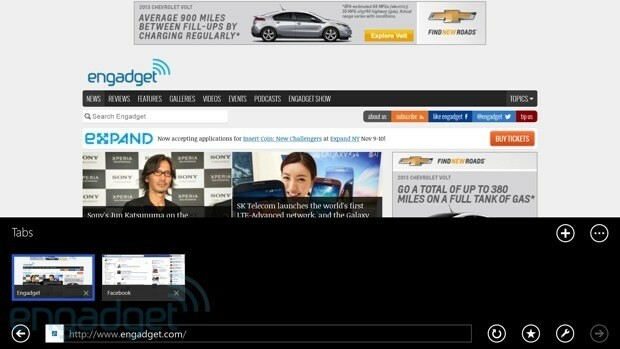 The only thing you might not get right away is maximizing windows: if you want to go full-screen, you'll have to drag the window up toward the top of the screen. Not difficult, but not intuitive either. 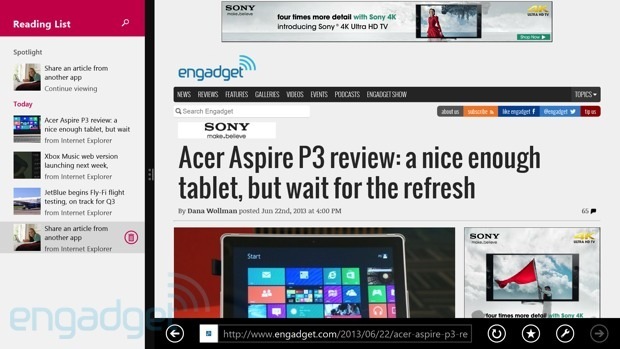 Search works differently in Windows 8.1. First off, let's talk about what happens when you use the Search charm. Whereas before you'd just see links to files, settings and apps, here you get more actionable results, like a specific settings option ("Sk" will lead to "SkyDrive storage space," for instance). All told, too, the results come not just from settings, apps and files, but from the web as well. You can even play music from the search results, so long as you search for an artist or album already in your Xbox Music collection. Do that, and a small music player will pop up onscreen, but it won't eclipse whatever screen it was you were looking at before you did the search. You have to try it to believe it. 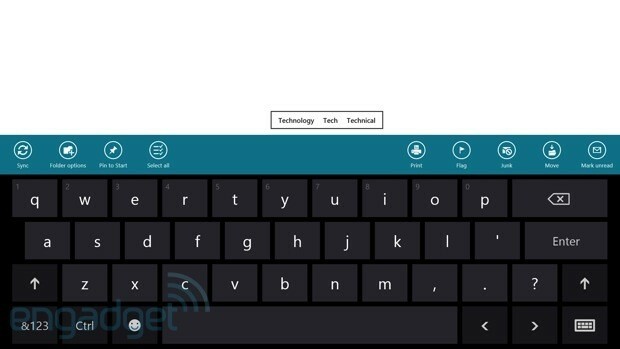 When Microsoft first showed us all the new keyboard shortcuts on Windows 8, we were skeptical: they looked cool, sure, but it was difficult to tell how well we average Joes would fare without any practice. Well, believe us when we say the new and improved keyboard works as promised. First of all, when you see pop-up spelling suggestions, you can swipe from side to side on the space bar to cycle through them, and then you can tap the space bar when you've highlighted the one you want. (The idea being, you don't have to take your fingers off the keyboard to pick the right word.) In any case, this gesture works like a charm, even on the first try, and it comes with a pleasing sound effect to match, so that you get a little audio feedback. Though we tried this several times, we never once created a space in the text by accident; the keyboard always seemed to recognize we were trying to select one of the word suggestions. Similarly, you can hold down certain keys like the question mark, which doubles as the exclamation key. From there, you'll see those other functions pop up nearby, always in the same place. (The exclamation point always appears right above the question mark, for instance.) What's cool is that once you memorize the different locations, you don't even need to do a long-press; you can just swipe up on the question mark to make an exclamation point. And it works! Almost every time, anyway. To continue with that question mark example, we usually got the exclamation point if that's what we meant to do. Sometimes, though, we ended up just tapping the question mark. It's a subtle difference between tapping and tap-swiping. Sort of like pawing the key with your finger. (If you've ever used a fingerprint reader, you might know what we're talking about.) In any case, it's pretty reliable, and we never, ever hit the surrounding keys, which is something we were concerned about when we first saw this demoed last month. It's tempting to just lump SkyDrive in with all the other apps we're discussing here, but we're calling it out separately because it's so pervasive in Windows 8. 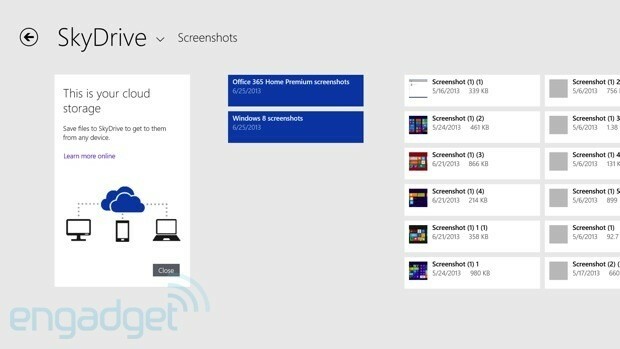 SkyDrive is much more deeply integrated here, with your files roaming from one device to another. Likewise, the SkyDrive app auto-refreshes with new files, even if you uploaded new material from another device. Even if you don't have SkyDrive open, it'll still stay up to date with the latest files and versions. And it's pretty instantaneous too: we added a photo to SkyDrive from a computer, and within a couple seconds, it was in our Windows 8 SkyDrive app. As we described in our initial preview, the Windows Store has received a big facelift in Windows 8.1, with popular charts like "Top paid" visible on the main screen, and categories accessible by swiping down from the top of the screen. In general, Microsoft has attempted to flatten the design, with pertinent info like stars and the number of reviews visible even on the main page. Open a download page and you'll see everything laid out from left to right: reviews, star ratings, recent reviews, a description of the app and more technical details like supported processors. Perhaps most importantly, though, Microsoft has also added a recommendation engine so that whatever app you're looking at, you'll see similar picks promoted alongside it. That's good news for users, who might not know how to discover new apps, but it's even better news for developers, who could use the extra promotion. We're so glad Microsoft added a Read It Later-type feature, because it's so much easier to have a repository for all your interesting finds than to rifle through bookmarks. And it works much as you'd expect too: once you've opened a web page, just swipe out the Share charm, and select "Reading List." The only slightly unintuitive thing is that in addition to selecting Reading List from the Share menu, you have to hit another, smaller icon to actually, for-real save that story to RL. Otherwise, you'll think you saved something, but it won't have gone through. On the plus side, we figured this out pretty early on, so the odds that you make this mistake twice are pretty slim. Inside the Reading List app, everything's initially laid out like in any other first-party Microsoft app, with large tiles you swipe through from left to right. Open a story, though, and the reading pane takes up a narrow sliver of space on the left-hand side, with the article itself getting top billing (that's the old 80 / 20 split coming in handy). By default, your stories are organized according to when you added them, with a rotating spotlight story up top. What's nice is that when you load up a story you found online, there's an address bar at the bottom, as in IE, so you can keep going on click-tangents if you want to. It's a pretty good way to rack up midday reading material as you're goofing off during your first hour in the office. Once you've finished an article, just swipe it in the list to get rid of it. Here, too, you'll have to do an extra tap, this time on a small trash can icon. It'd be nice if you could just swipe stuff to get it out of the way, but at least the current setup is easy to follow. 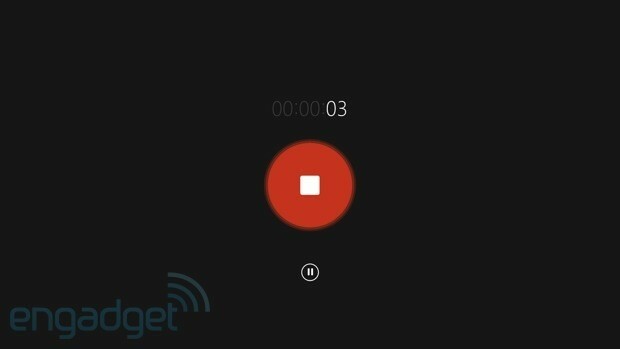 Microsoft still hasn't said much about gaming at Build, and we're not sure it will, but it has issued a few updates around Xbox Music and Video. 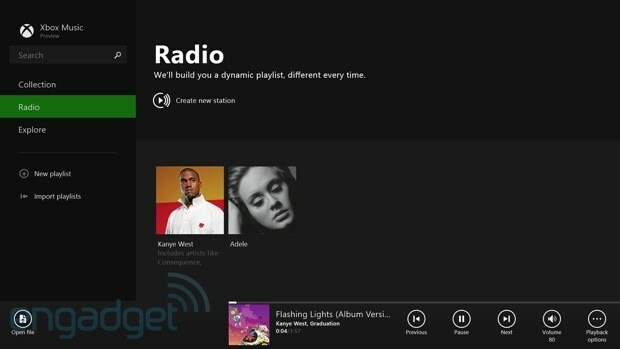 Starting with Music, the new Xbox Radio feature creates playlists based on suggested artists and albums. Want Adele? You'll get similar singers like Jamie Cullum too. What's nice is that you don't need a subscription to make use of this feature. And if there's a limit to how many times you can skip tracks, it's certainly not obvious. Otherwise, the Music app has been redesigned so that it's generally easier to get at your music collection. The left-hand pane has tabs for Collection, Radio and Explore (all self-explanatory), and from there, you shouldn't have to do much more clicking. Xbox Video, meanwhile, can send video to the Xbox One, with the Xbox One picking up right where you left off. 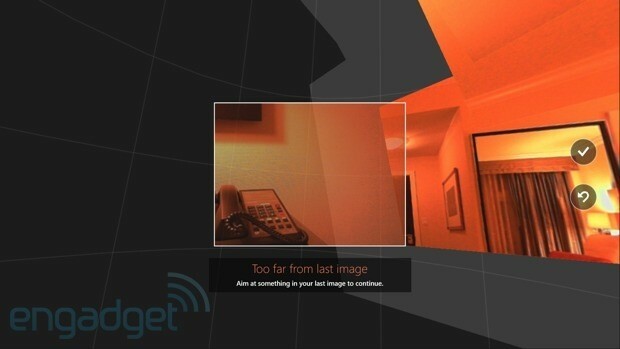 It's not that different from what you can already do with SmartGlass, really. The difference is that whereas you had to go out of your way to download SmartGlass, the Xbox Video app comes loaded on every Win 8 device out of the box. You haven't heard the last from us on IE 11: we fully expect Microsoft will do a deeper dive on its new browser before Build ends later this week. For now, here's what we know: the Metro version now supports an unlimited number of tabs, which roam to your other devices. Also, the tabs now sit at the bottom of the screen, above the URL bar, which is perfectly fine with us. Not that we necessarily prefer having tabs up top or down below, per se, but we do prefer to have them grouped with the address bar. Ya know? The biggest addition here is a panorama capture feature, denoted by an obvious-looking icon on the main camera screen. 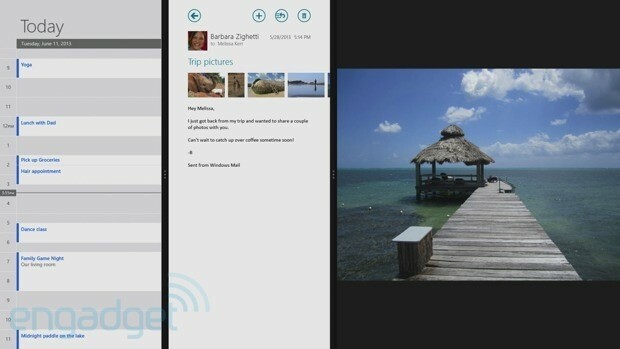 In contrast to the panorama modes you'll find on other devices, Microsoft says there's no clicking required. You don't even have to follow arrows; all you have to do is move the device around. As we found in our hands-on, this isn't strictly true. There are indeed guides onscreen, helping you to move the tablet in a smooth line back and forth, or up and down. Perhaps we just need more than a few hours of practice, but we too frequently got an error dialog box saying we were too far from the last image, which means there really is a limit to how herky-jerky you can be. We're willing to give it another try, but for now, we know this: all those impressive sweeps of cathedral domes Microsoft might show off clearly took a bit of practice. We had much more success with the new editing tools in the Photos app. Whereas this application used to be more of a viewing library than anything else, it now has a host of editing options, including temperature, tint, saturation, contrast, brightness, highlights, shadows and basic fixes like rotating, cropping and red-eye removal. You can also apply artsy effects, including vignette and selective focus. The showstopper, though, is a feature called Color Enhance, which lets you alter the color on a specific part of the picture. In short, it's stupidly easy to use: just drop a pin on the photo (yep, a pin like you'd find on a map) and then spin your finger around an on-screen dial to pump up the saturation. We tried it a few times, partly because it's addictive, and partly because we so wanted to stump the computer. We couldn't. It worked when we dropped the pin on a small patch, like a little umbrella all the way in the distance. It even worked on ill-defined areas, like a blue sky with scattered clouds. Go ahead and try it for yourself -- and remember that you can cancel any changes if you have second thoughts. As some of you might know, I train for marathons in my spare time, which means I'm intensely interested in apps like Health & Fitness, but I also take them with a grain of salt. There are lots of things you can do with this brand-new application, including tracking your diet and exercise and researching things like prescription medications, exercise routines and calorie counts. What I find most irresistible -- and what you might enjoy too -- is the 3D diagram of the human body, which allows you to select ailing body parts as well as various symptoms. As it happens, I've got a slightly bum knee, with a stiff hip flexor to match. Bing correctly supposed that I might be suffering from tendon inflammation -- a diagnosis my sports medicine doc would surely agree with. But Bing also offered the possibility I have arthritis or chronic inflammatory disease of the axial skeleton (yikes). A disclaimer, written at the bottom of the screen, said the data came from Healthline Networks and Visual Health Solutions. I haven't heard of those services, to be honest, but even if it were a mainstay like WebMD, I'd be skeptical. This app is fun, and you should definitely try it, but for a real diagnosis, I don't trust Dr. Bing any more than Dr. Google. But hey: your body, your choice. Other notes: the food tracker has a lovely, easy-to-read interface, but it only really works if you enter generic foods. The database doesn't have much in the way of brand names, like Ben & Jerry's, so using it to log your food intake might be impractical at this point. 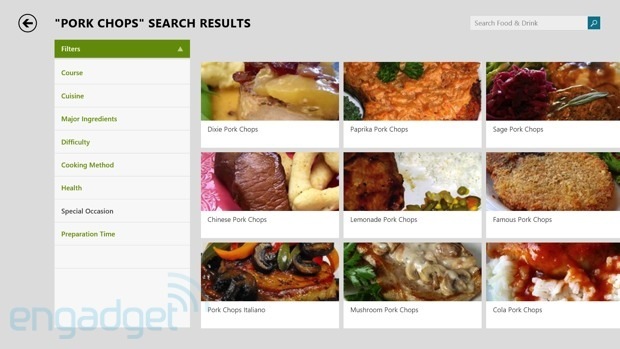 You can do lots of things with the new Bing Food & Drink hub: create shopping lists, plan your meals for the week, discover recipes and even learn new skills, like stir-frying. (The trick is to keep the heat high and use very little oil.) Perhaps the most intriguing part, though, is that you can use a hands-free mode when reading recipes, in which you wave your hand to turn the page. That way, you don't have to touch the screen with your sticky, grease-covered fingers. To do this, you'll want to select the hands-free option toward the bottom of the recipe page (it's strangely not an option in the standard app settings menu). So we tried and it works... eventually. It took us a few tries to get it to work at all, and even then, we definitely made a few swipes that didn't register at all. With a little time and extra waving, though, you'll get the hang of it. You've got three options here: alarm, timer and stopwatch, with countdowns in particular lasting 15 minutes or less. For both the alarm and timer, you move your finger around a clock to set the time, instead of using a slot-machine-style setup like on Android. It's a little early to say conclusively, but so far, we like this method better: it's a more to-the-point approach. And the UI has a clean, modern look too, which is always a plus. Oh, and we'd probably be missing the point if we didn't mention what kind of alarms you're getting. In all, there are 10 chime options, all of which seem mellow enough that they probably won't startle you first thing in the morning. A good or a bad thing, depending on how heavy a sleeper you are. 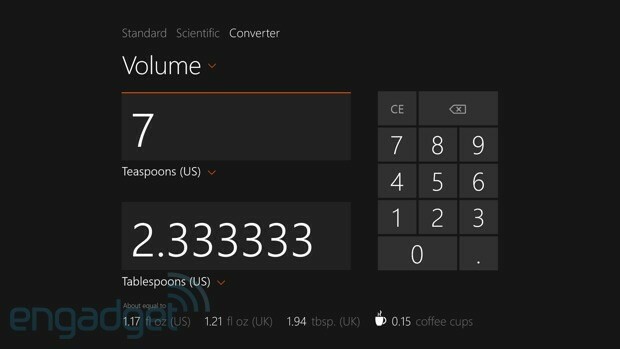 Microsoft is a bit late adding a Metro-style Calculator to Windows. To make up for it, though, the company went out of its way to make this a really, really good calculator. In addition to standard number-crunching, you've got various scientific conversions, along with a unit converter. That last element works smoothly, though you do have to take the time to select your respective units from drop-down lists. That's not difficult, but doing a Bing search like "7 inches in mm" always seems to be the faster option. It is what it sounds like, folks. The UI sure is pretty, though. We're not sure if Windows 8.1 is distinct enough to win over folks who've been skeptical of Windows 8, but they may want to take another look. Certain key changes, like a common wallpaper option, boot-to-desktop, deeper search, more windowing options, a redesigned Windows Store and a new Reading List app make this version of the OS more enjoyable to use than the last. And for folks who already bought into the OS, 8.1 makes for one meaty service pack. If you're not downloading it now, you should be.